With the constant support of our renowned vendors, we are engaged in offering a wide assortment of Gas Leak Detection System. Presently the Gas Leak Detection System range of products includes small Domestic Gas Leak Detectors to simple Gas Leak Detection System, which only gives an audio-visual alarm apart from that these also includes highly sophisticated integrated system, complete with power back-up and display unit which indicates level of leakage as percentage of LEL or in PPM with pre-set alarm points. Also, we offer handy and portable Gas Leak Detectors, which are very easy to operate and maintain. 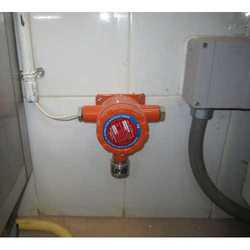 Both the Systems are available for detection of all types of gases including flammable, toxic and other special gases. We offer innovative design ‘Odor Monitors’ for abnormal Temp. We also supply detection system using Odor Sensors. The Temp Detection System is normally installed on cables and which gives an odor depending on the Temp and which is sensed by the Odor Sensor thereby giving a warning before a major failure of cables takes place, thus preventing serious accidents. With ever increased concern for environment all around, both these Systems are gaining popularity. Looking for Fixed And Portable Gas Leak Detection System ?